you might love some of our earring designs as well. Beaded Scarves, Belly Dancing Scarves, or Just An Exquisite Accessory, whatever the name they are truly sweet. This scarf is a one of a kind. 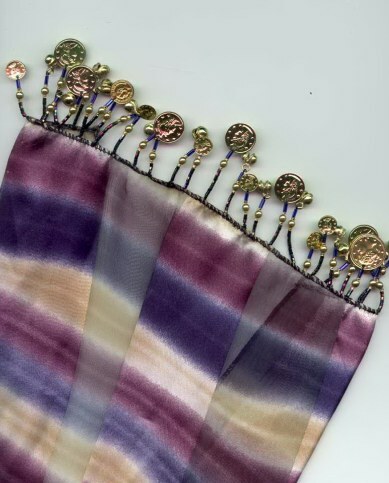 Berry blue and purple scarf embellished at the ends with beautiful bead work detailed with bells and coins that make a beautiful tinkle sound. 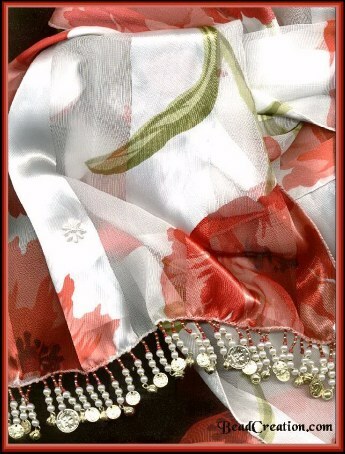 Truly beautiful one of a kind handcrafted scarf. Ends are detailed in red glass beads, simulated pearls & gold bells and coins which tinkle when they move. Scarf has sheer vertical stripe pattern. Small simulated pearl flower sewn on solid stripe. (shown in picture right) Please click on picture for more views of this scarf.